A legendary late, great trainer informed the public six years ago about the greatness awaiting the heavyweight division. Before his untimely passing in 2012, Emanuel Steward spoke highly of two rising heavyweights geared to take over the division once Wladimir Klitsckho’s reign ended. “There’s one kid in America no one speaks of and that’s Deontay Wilder. He was on the Olympic Team (United States) he lost but he’s a big kid,” said Steward. This past weekend exhibited the rare instance in which the main event matched or arguably exceeded the pre-fight hype building over the course of several months. 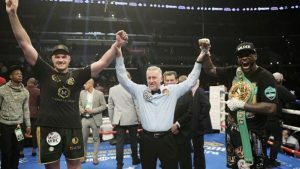 The WBC heavyweight champion Wilder 40-0-1 (39 KO’s) battled the Lineal heavyweight champion Fury 27-0-1(17 KO’s) over the course of 12 exhilarating rounds. Although the bout ended in a draw, there were winners and losers for this event. We’ll start with the losers. It’s hard to be considered a loser when you’re the unified champion of the division, holding three of the coveted world titles and undefeated. But for Joshua, who wasn’t in attendance due to business obligations, appears to be an afterthought amidst the excitement and controversy stemming from the past weekend’s event. The perception amongst many boxing circles suggests Joshua or his team is avoided possible unification with Wilder for quite some time now. These very same circles of people may possibly add Fury to the list for Joshua. Fury spoke his piece on the potential of facing Joshua in the near future post-fight with Wilder. Now for the winners. The first obvious choice is the Gypsy King. Battling depression, ballooning up to 400 lbs., over two year lay-off, battling substance abuse, Fury’s struggles are well recognized at this point. “I think it’s all been well documented. But it didn’t get me. I found a way. What doesn’t kill you makes you stronger, more determined. My story has got more pain in it now. I believe that rain has passed and the sun is shining brightly,” said Fury about his struggles and comeback. Realistically, Fury entered this situation as a win-win opportunity. Some of us within the boxing community believed in Fury’s boxing ability and mental capacity to come back and defy the odds – in which he did successfully. If he were to lose, the narrative casted was he supposed to be destroyed by the knock-out artist Wilder and there would be no shame in losing. Contrary to Showtime commentary, Skysports commentary and other observers, Wilder is the winner because he walks away with his title. We must remember, rounds are scored subjectively and judges do not have access to punch stats. While analyzing the punch stats, cumulatively and round-by-round, Fury has the edge regarding accuracy and efficiency, but the statistics are closer than you would think and Wilder was the aggressor. Either way, there’s a compelling case for a rematch. Ultimately, the fans won Saturday night as well. No matter the result of the fight, it was highly entertaining. The walk-out introductions for each fighter was captivating, with Fury walking out to a mixture of three songs and capturing the support and adoration of the United Kingdom contingent travelling to U.S. soil to support their fighter. The pitch-black setting for Wilder, walking out to large bombastic sounds and accompanied by budding Hip-hop star Jay Rock, performing his popular song “Win.” The fitted golden mask/crown was a nice touch as well. Each fighter throughout the course of the event whether it was the walkout entrance, post-fight interviews and most important through-out the course of the fight exhibited their showmanship as fighters and displayed their contrasting, unique personalities. How often do we get to see large, stylistically awkward, elite level fighters? They’re mirror images of each other regarding uniqueness, but obviously their styles and stories are different. But when blended together the equation is pure entertainment. The ultimate winner was the sport of boxing.